Julian of Norwich (c. November 8, 1342 – c. 1416) is considered to be one of the greatest English mystics and the first known female writer in English. Little is known of her life aside from her writings. The name "Julian" itself comes from the Church of Saint Julian in Norwich, where she occupied a cell adjoining the church as an anchoress. At the age of 30, suffering from a severe illness and believing she was on her deathbed, Julian had a series of intense visions. They ended by the time she overcame her illness on May 13, 1373. These visions, 20 years later, would be the source of her major work, called Sixteen Revelations of Divine Love (c. 1393). It is believed to be the first book written by a woman in the English language Julian became well known throughout England as a spiritual authority. Margery Kempe, perhaps the earliest autobiographer in English, mentions going to Norwich to speak with Julian. Julian's theology was particular optimistic, especially considering the times in which she lived. She saw God as a mother—perhaps the first Catholic writer to express this idea—and believed that God feels no wrath toward mankind but will one day make "all things well." Although never formally canonized, she is known as "Saint Julian of Norwich," and is commemorated in the Catholic Church on May 13, and in Anglican and Lutheran churches on May 8. 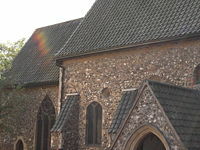 Nothing is known of Julian before she took her place at Saint Julian's Church in Norwich. Even her original name is uncertain, as she probably took the name by which she is known from the church she entered. She could have been a Benedictine nun before she became an anchoress or she could have known the local Beguines, the Roman Catholic laypersons who lived in a loose semi-monastic community, who dwelt nearby. Saint Julian the Hospitaller, from whose church Julian of Norwich may have taken her name. She lived in a tumultuous time, the Black Death was raging in Europe. The first such plague occurred when she was only six years old. The road beside Saint Julian's Church was used to remove the bodies of the dead from subsequent plagues, and she probably heard the carts rumble by. The Hundred Years' War between England and France had begun in 1337, as did the papal schism in which two popes each suspected the other of being the Antichrist. Famine and cattle disease contributed to the forces that caused the Peasants' Revolt, and John Wycliff and his followers, the Lollards, were declared heretics. Some were burned and buried near Julian's church cell. She must have been aware of the suffering of the time. In her desire to find union in God's love, she reported asking God for three graces. The first was the "recollection of the passion," to experience the crucifixion of Jesus as if she had been a witness or even as if it were happening to her personally. The second was to experience an illness so severe that everyone would think she was dying and to have it occur at age 30, the age of Christ when he was crucified. By experiencing the pains and terrors of such a serious illness she felt that she could live more fully with God. The third grace was for three "wounds," which she characterized as "the wound of contrition, the wound of compassion, and the wound of longing with my will for God." She thus believed that her request for three graces of God led to her the illness and the visions which transformed her life. At age 30 Julian became so ill that she was not expected to survive. It was during this illness in May of 1373 that she had her visions, about which she initially wrote a short outline of her "showings" in 25 chapters. Twenty years later she wrote a much longer version with many more details and explanations in 86 chapters. In this second version she removed the original disclaimer that she was just "a woman, weak and frail." In the second version, she is now a confident counselor with time for reflection, contemplation and discourse with God as to their meaning. She has realized that her visions were not just for her own edification but for all people to learn how to seek God. 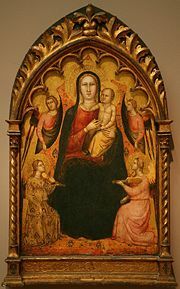 Images of the Madonna and Child were common in Julian's time and may have inspired her belief in God's motherly attributes. Her great saying, "Sin is behovely (useful or necessary), but all shall be well, and all shall be well, and all manner of things shall be well," reflects her theology on sin. Sin is necessary, she argues, "because it brings us to self-knowledge—knowledge of our own fallibility—which in turn moves us to seek God." It is considered to be one of the most individually famous lines in all of Catholic theological writing, and certainly one of the most well-known phrases of the literature of her era. It was quoted in T.S. Eliot's "Little Gidding," the fourth of his Four Quartets. To Julian, sin is "all that is not good," which includes the suffering of Jesus. She taught that humans usually fall into sin out of naïveté and ignorance not out of wickedness. Our mistakes cause us to humbly seek God. She says then, that sin is necessary, or "behovely," as life is a school where we learn from our mistakes. She saw no wrath in God, only in humans. However, "God forgives us for this," she declared. When she asked God about hell and purgatory, she received no answer. At the end of time, she believed that "all will be well" by the mystery of God, when all things will be made good again. Julian reported having a personal and reciprocal relationship with God in which she received insight and understanding as a result of the questions she asked him. Although she lived in a time of turmoil, Julian's theology was optimistic, speaking of God's love in terms of joy and compassion as opposed to law and duty. For Julian, suffering was not a punishment that God inflicted, but was a means he used to draw us closer to Himself. This differed from the prevailing views of her time, which typically saw afflictions like the Plague as divine punishment. 1. The Crown of Thorns and God's love for all that is made—also called the "hazelnut image"
13. The great deed of God's making amends for our sin, and that He will make "all things well"
In this little thing I saw three properties. The first is that God made it. The second that he loves it. And the third, that God keeps it. But what is this to me? Truly, the Creator, the Keeper, the Lover. For until I am substantially oned (united) to him, I may never have full rest nor true bliss. That is to say, until I be so fastened to Him that there is nothing that is made between my God and me. Julian's positive, hopeful message is beloved by many and held in high esteem by Catholics and other Christians. Her teachings on sin, forgiveness, and the motherhood of God are unique in Catholic theology. Although she was never beatified she is called "Saint" Julian of Norwich. She is commemorated by the Roman Catholic Church on May 13, and by both the Evangelical Lutheran Church in America as a renewer of the Church and the Anglican Church on May 8. 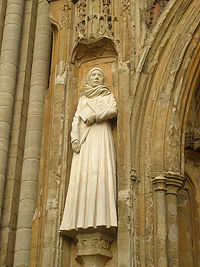 A modern statue of her has been added to the facade of the Anglican Norwich Cathedral. The song "Julian of Norwich" by Sydney Carter commemorates her optimistic philosophy. ↑ "Julian of Norwich", Encyclopedia Britannica Profiles in Encyclopedia Britannica, June 16, 2006. ↑ Carol Lee Flinders. Enduring Grace: Living Portraits of Seven Women Mystics. (HarperCollins, 1993). ↑ Lynn Staley, (ed.) The Book of Margery Kempe, Book I, Part I. TEAMS Middle English Texts. (Kalamazoo, Michigan: Medieval Institute Publications, 1996) online  Library, Rochester University. Retrieved April 15, 2008. ↑ Early non-canonical writings speak of God's motherhood, for example the Gospel of Thomas, in which Jesus portrays the Kingdom of God in terms of making "the male female and the female male," and the Gospel of the Hebrews in which he speaks of the Holy Spirit as "my mother." All links retrieved May 26, 2014. History of "Saint Julian of Norwich"
This page was last modified on 26 May 2014, at 20:01.